A version of this story even appears in the Hank Harrison book The Dead. In their October 23, 1975 issu, Jet magazine published an article as well. I have read three versions and the three are so different that they could be construed as separate events. So what was the truth about the Cat Olsen incident? What really happened at 1130 WNEW-AM in 1975? So let's start with the evidence. In the archives at the Paley Center for Media is a 30-minute tape made in September 14th, 1975 at WNEW-AM. They list a summary that understates the unusual nature of this tape. "This radio program features an on-air telephone conversation between disc jockey Scott Muni and a man named Cat Olson, who is in the process of holding up a bank. Olson called the radio station during Muni's regular program and demanded to talk to the disc jockey about the robbery and the hostages he is holding. Topics discussed include the following: the reason the bank alarms are not being turned off, despite Olson's request for peace and quiet; the reason he released some of the hostages; the number of people that are still being held inside the bank; Olson's other requests; the reason he has withdrawn from society and refuses to trust anyone; Olson's greetings to people via radio; whether the bank robber wants Muni to be a negotiator between the police and other officials at the scene; Olson's desire to speak with a woman named Mouse; Muni's decision to go down to the bank to meet Olson and try to talk him out of the hostage situation; Mouse's insistence that Olson give himself up; and Muni's departure from the radio station before the end of his shift so he can meet the bank robber face to face. The program concludes with a news, weather, traffic, and sports report. Includes a commercial." All of the above is true but incomplete. 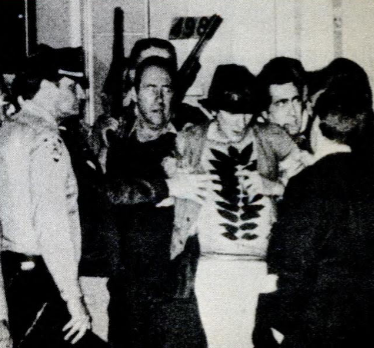 A man named Ray "Cat" Olson (spelled Olsen in the Harrison version and NY times) took hostages at a bank and demanded airtime on WNEW with DJ Scott Muni. Jet magazine identifies the bank as Bankers Trust Bank in Greenwich Village, in New York City. "Naturally, the police, when they finally arrived on the scene, asked this rather disheveled man wearing bright floral pattered shirt, sneakers, and an army jacket, what his demands might be. He replied, not money, not power, not any of the normal things a normal bank robber asks for; instead good old Cat wanted only to hear three consecutive hours of Grateful Dead music played on the AM radio with an additional three minutes allocated to he, himself, for his message." Against all odds, the demands were met. Olsen spoke at length with Scott Muni on air about the Grateful Dead, about Jerry Garcia, Patty Hearst, the Symbionese Liberation Army and also about the plight of blacks in America and about James Brown. The Harrison version skips this part but Jet was all over it. Olsen asked to speak with James Brown. Brown was contacted and he did offer to fly from Los Angeles to help the police. But before Muni, or Brown, or Jerry Garcia ever spoke with Olsen, the police fulfilled another demand. Olsen swapped 10 hostages for a six-pack of beer. He drank it all, and took a nap and was then easily subdued by his captives. After 31 years on WNEW, Muni was fired in 1998 as part of a veteran DJ purge. Brown cancelled his New York flight and instead appeared on the Johnny Carson show that night as scheduled. Olsen went directly to Rikers.